It’s Spring! (I hope…) And a giveaway. I hope spring is starting to make its lovely appearance where you are (or autumn, with the blessedly cooler weather, in the Southern Hemisphere)! Here in our little part of the Home Counties, just north of London, it’s very definitely spring. Sunny days, cold crisp nights, and the cheery brightness of daffodils! Lots and lots of daffodils! But like most things in the homes of people who’ve been married a while, those daffodils have a story. Some couples are brought together by shared interests. Some couples are pushed apart by shared interests they have very different ideas about. That would be me and my husband when it comes to the garden. His idea of a good garden is immaculately neat and tidy. When we married and I moved into the house he’d owned for eight years, the small garden was a bare rectangle of lawn. Mowed with military precision to literally within an inch of its life at the same time every Saturday afternoon. All edges trimmed precisely square. I loved my husband. But oh, how I hated his yard. Confession time – I am not a “good” gardener. I like a wild messy garden that thrives on neglect, bursting with food plants and trees and flowers and birds. I like plants that seed themselves and pop up where you don’t expect (some people call those weeds). Pretty much his garden room 101. We argued over lovingly discussed making some changes out there. It was the idea of attracting wildlife that swung it for him. That, and my promise that a prickly rosa rugosa hedge would be loved by birds and hedgehogs, but not loved so much by the neighborhood kids who rode their bikes across his precious lawn as a shortcut. He agreed – I could plant the hedge. I did it in early winter, before the ground froze hard. Dug out a trench all the way along the boundary. Hauled bucket-loads of broken bricks and builder’s rubble from the heavy clay soil. Planted the roses I’d mail ordered, brown dry sticks a foot long. Hard to imagine they would grow, let alone flower. I got a bag of a hundred daffodil bulbs very cheaply, as the right time for planting them was long past. Poor dried up shrivelled things. In they went too, though I had no idea if they would take or not. I put in so much work, and for the first two months, all I had to show for it was a foot-wide strip of dug over ground along the front and side footpaths, with sticks poking out every eighteen inches. But Spring came, and we had sunny yellow daffodils. Summer came, and we had roses, white, pink, cerise, the scent attracting bumblebees. Fall brought fat orange rosehips, and birds to feed on the seeds. My husband decided this wasn’t too bad after all. He dug a small wildife pond. He let me plant trees, and a whole lot more. He loves the garden now, happily spending an hour or so a day pottering around out there. He still thinks it’s too wild and messy. I still think he is too fond of straight lines and pruning so everything matches and cutting the grass too short. But we don’t argue over it anymore. We learned to compromise out of love for each other, because of the garden. And those fifteen year old daffodil bulbs I thought would never grow just keep getting better and better. This year we have the most blooms we’ve seen. The hyacinths I planted last spring (they have a story, too!) flowered beautifully. I needed spring to come. I needed those flowers to bloom. I was way behind on writing deadlines and had to shelve my planned spring book (about a couple who fall in love while making a garden!) until next year, because it wasn’t done in time. I’d despaired, because my health wasn’t improving. God used the garden to remind me to keep hoping. What looks dead and shrivelled and hopeless will flower, in its season. He makes all things new. We just need to wait patiently through the fallow times. And trust that spring always comes. What does your ideal garden look like? One commenter before April 6th will be chosen at random to win a copy of A Lesson in Love, last spring’s book (LOL, also about a couple who fall in love while making a garden!) , or their choice of my ebooks. HI Autumn, lovely picture and thoughts from your garden- we love bulbs here, every time we are at the markets, my husband heads straight to the bulb seller!! 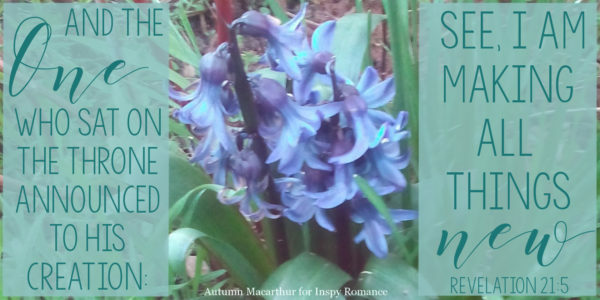 Your post reminds of a beautiful song by Nicole Nordeman called “Every Season”. Blessings, and enjoy spring- it was quite cool here today!! It’s autumn for you, of course! When I lived in Bathurst, I made a very cottage-style garden around my old house. March was always exciting – time to buy and plant new bulbs for spring in September! My ideal garden would look like one of the gardens I have seen in NH. It would have plants that bloom from spring through fall and the colors would be vibrant and pretty. I would also have garden statues and a bench to sit and read among the flowers. There would also be some flowering shrubs too. I would have daffodils, daylilies, astibe, Miss Kim lilacs, gerbera daisies, liatris, and many more! Hi Autumn! Spring is arriving in Michigan. This week we are having April showers. Around my ranch house, My purple crocuses are blooming and the daffodils are up and budding. In May I have a blooming lilac bush. In summer a purple hydrangea. Most neighborhoods in America’s heartland or Midwest have large lawns with shrubs surrounding the house and our large deck. Most of the landscaping came when we purchased our home 17 years ago. There are many ways to enjoy the beauty of nature. While taking monthly back road trips last year I noticed the flowers along our roads – in spring daffodils, then in summer flax and day lilies. Happy Spring and Writing. Would enjoy reading A Lesson in Love. Renate, your garden sounds lovely! I adore crocuses, but every time I plant them, the mice dig them up and eat them! Yes, it’s wonderful seeing what flowers grow wild. We don’t see much flax or daylilies growing wild here. When we visit my husband’s mother, the road passes through a long stretch of woodland, part of a huge estate with a stately home. In February, it’s the first snowdrops that excite me. Then daffodils in March, finally, in May, the wild bluebells. Hi Autumn! I love your photos. Daffodils are one of my favorite flowers. Sadly, many of our flowers and trees were damaged after a hard freeze following above average temperatures. Praying for improved health for you. Thanks for the prayers, Jill. :) So sorry you had that frost. I expected we would get hard weather in March as the winter was so mild, but so far, we’ve escaped it. We may still get what is called a “blackthorn winter” snow or heavy frosts in April, when the hawthorn is flowering. We have a messy garden with birds and butterflies. I’m looking forward to planting a garden when we find our new house. I love the vision this paints. I too love the random volunteer plant that appears here and there. What a great lesson! Thank you for sharing this beautiful story, Autumn. By the way, I loved reading A Lesson in Love. As for my ideal garden, it would be filled with roses, but in reality, I have a black thumb. Even cactus didn’t survive. LOL. Alexa, cactii are very hard to keep alive! Roses – I once had a house in outback Australia. Very dry, red dirt, rained maybe three times a year. I planted roses, and drip watered them so they got a small but constant trickle of water to get them started. Then I moved away and the house was rented. No one ever watered the garden. When I came back, those rose bushes were eight feet high and COVERED in flowers! So just to say, even with a black thumb, you may find roses easier than cacti! Lol, Autumn! I thought cacti were the easiest plants to take care of – one doesn’t even have to water them! I love flowers! The more the better but alas I can’t take care of them like I used to after knee replacement. The last three years mine have been neglected. This year my husband has suddenly developed a green thumb. My daughter thinks he’s finally taking after his dad that owned a flower shop at one time! Hugs on not being able to garden like you used to, Gail. Great that your husband has taken over and discovered his inner gardener! I’m having to change how I garden now, too, I can’t get out and dig in the dirt like I used to, because I fall over! Even walking around the garden isn’t easy with walking sticks. So next project I’m annoying my husband with is an indoor kitchen garden. I have spring onions, garlic, micro-greens and herbs growing in the kitchen. Plus water kefir, sourdough, and apple cider vinegar, all fermenting away quietly in corners. I love it, he hates it! I already have, and have read, A Lesson in Love, but I wanted to comment on the daffodils. I’m envious that yours are still blooming after 15 years! I have some miniature daffodils that bloom every year, but my big ones will bloom for a year or two, and then the leaves come up every year after, but no blooms! Oh, that’s disappointing, Margaret. I do love those miniature ones too – I have some in pots. So cute! Some possibilities with the daffodils – are winters where you are cold enough to stimulate flowers? I think they need a certain amount of chill to flower. Is a very tidy gardener (like my husband till I asked often enough that he stopped) cutting off the leaves once they turn yellow? They need to be left till they shrivel right up, as the bulb pulls all the nutrients it can out of the dying leaves and stores them to make next spring’s flowers. Or if it’s neither, they could be crowded. I had this in my garden in Australia. I had to dig them up once the leaves died right back and space them out more. It could just be natural cycles, too. I haven’t done anything with mine, just left them where they are. No feeding, no dividing, nothing. Some years we get a lot less flowers than others. Last year, I think there weren’t half what we had this year. We live near the coast in California, so get a few days with frost in the morning during the winter. Until this year, we had about 5 dry years. With our rains this winter, a lot more daffodils came up than have for all those years, but still didn’t bloom. I don’t cut off the leaves, but have wondered if they need more sun. In reading the comments below, we have snowdrops that have bloomed for years and years – in the same general location as the daffodils! They will probably bloom wonderfully next year! Here in southeastern BC, Canada, almost all our snow is finally melted and the flooding in our fields and valley is receding. Snowdrops are blooming in all their glory and shy purple and yellow crocuses are poking up through our lawn where hubby and I planted them several falls ago. We’ll be a while before the daffodils begin to show! I love the idea of a nice yard and flower gardens far more than I love the work. In the bits of time I get outside, the veggie garden gets the attention… and not nearly enough of it! I dream of hiring a landscaper to create flowerbeds, paths, patios, pergolas, ponds… you name it. And then someone to come in regularly to care for it all. I’d love to sit outside and enjoy it! I’m glad you had no flooding! So, is this mud season? Though I love them, I’ve never managed to keep snowdrops or crocii, I suspect the field mice eat them. Bizarrely, the regulations where we live forbid growing vegetables. I have put in as much fruit producing plants as I can (nothing better than going and picking my breakfast berries from my garden! ), and some low-growing green leafies. A gardener to do all the work sounds like a wonderful plan! I’m like Valerie. I love the idea, but not the work. My parents, once we moved out, started gardening and they did such a great job that people would stop to admire their work. We moved in 2014 to our “forever home,” and the one concern I had was the landscaping. There is so much. It’s mostly greenery, and I don’t love it. When I try to work on it, no matter how I try, I get poison ivy. But the color I’ve added and the little time I’ve spent, it is worth it. Hi Autumn, I remember other posts when you’ve shared about your husband, and I can just picture his need for an organized garden and your attempts to make it wild and messy, but colorful. It’s beautiful to hear that he now shares your care for such garden. My husband and I are looking for a new place to call our own and I’ve been adamant about having a garden. We live in a big city, so those are kind of rare. We’ve considered moving to the suburbs but after getting used to get to work (and back) quickly, we’re reluctant (specially while I still teach night classes). So now we’re discussing the many ways to be creative. I really enjoyed reading A lesson in love. He does still find out garden difficult, I think. It really offends his need for things to be orderly. But he loves animals, so the birds and hedgehogs, and the newts and frogs in our little pond, reconcile him to the necessary untidiness in a wildlife garden. I do hope you and your husband find a wonderful place to live. A roof garden might be an option in the city? I think our husbands share a love fore birds, which is hard in a roof garden, but it suits my need for green (although I really wanted to have lemon and orange trees). Still, we’ve been talking more and more about roof garden than finding a house lately. Praying you’re led to the perfect place, Priscila. Hi Autumn, your garden must be really nice and I loved your story about it. Daffodils are my favorite flowers! I first saw them in Germany when I was 18 and fell in love with them.They were all around the city this time of year, absolutely lovely! They are called Osterglocken there – Ostern means Easter – and they have this name because it blooms usually around Easter. Unfortunately where I live now they don’t grow much. What a lovely name for them! Daffodils come at the perfect time, so sunny and cheerful, and they often bloom just when we’re all feeling fed up with winter! I hope you get some other lovely flowers instead, even if you need to grow them in pots. We have some very lovely flowers here as well, thank you. Autumn, your garden sounds lovely. The hot, hot, hot summers where I live aren’t great for gardening, even though we have drips to water plants. Our lawn is pebbles and fake grass in the form of a putting green. I do have one little bed of Vinca, the only flowers I’ve found that survive the heat. I share your love of wild gardens. I call them old-fashioned gardens, where everything just grows together. I especially like my perennial phlox–all different colors–and Asiatic lilies. I have a lot of different hostas in the shady parts of our yard. It takes a lot of work, but I can usually get my husband to help with it a bit. Now that we’re getting older, it’s harder, though. It may get really wild! We have deer and pheasant quite often around our house, and a lot of birds. Your garden sounds wonderful, Winnie. Those old-fashioned plants are the best. :) Prayers for good health so you can enjoy plenty of time in the garden this season. Your garden sounds lovely. I also love wildflowers that seed themselves. At this time, I have yellow daffodils and forsythia blooming. Autumn, I’m sorry to hear that you’re not feeling better. I’m praying for you (and me, too, as I have an autoimmune disorder I’m trying to find help for). That’s the reason our wildflower garden is overgrown now, as I can’t get out there and keep it weeded. But it still provides some lovely surprises. I looked out the window today and saw my mother’s wild flame azalea, a bright golden orange, is now blooming and taller than the 6-foot fence. My grandmother’s snowflakes are almost through blooming, but the birds must have “planted” some I didn’t have before. They’re now happily blooming right in the middle of the bed right outside the window, like the birds knew just where they’d show up the best! The white wisteria from my grandfather’s “old home place” in southwest Mississippi is blooming, and soon the old magenta rose my mother rooted from a cutting from there will bloom, but only for a few days. One of his ancestresses had brought it there in a wagon from South Carolina in 1810. So many of my plants bring back memories of the people I love. The kind of garden I love best reminds me of the descriptions in _The Secret Garden_ and _The Forgotten Garden_. I like to imagine the gardens God will give us when we get to heaven, with all the energy to work in them without tiring and with great joy! Hugs, Kathryn. Praying for you too! Your garden sounds wonderful! I love that so many of your plants have such history attached. A garden like that is like a memory box. So precious. I love flowers, so any flower gardens would be just what I would like. They each have their own beauty, don’t they! Flowers are such a wonderful gift from God! Hi Autumn, I am with you, I like wild gardens. Especially with lots of poppies in. For some reason last year none of the wild poppies appeared which was very odd. The previous year we had had loads with a couple of purple ones added into the mix that the birds had dropped. I was really looking forward to seeing them again. I waited for them to grow and flower and was rewarded with nothing. This year my son brought me six packets of poppies for Mother’s day – he knew how important they were to me. Poppies make me smile, they are so delicate but proud, standing tall above the other wild flowers that have seeded themselves in our wild garden. Anything that grows in our garden is a miracle anyway. Therefore we prefer nature to choose what is going to grow as these have the best chance of surviving. Hope you improve healthwise this year – God has it covered. I’ve found that with poppies too.A couple of good years, then they disappear. I read that the seeds lie dormant until the ground is disturbed. So to have poppies keep coming back, we need to dig a little! That’s why they grow so well at the edge of plowed fields. My ideal garden is one full of pretty plants that bloom throughout the season and are taken care of by someone else. lol. Spring is definitely arriving here in Ohio but after yesterday’s high temperature of 78 degrees, today’s high is only in the mid-50’s. LOL, Jessica, I think that idea is perfect. We get to sit back and sip iced tea and enjoy the flowers!